It is the ultimate culinary showdown, the battle of all battles, the controversies of all controversies. Which would win: chocolate or vanilla? Oddly enough, chocolate and vanilla were introduced to the modern world at the same time. Hernán Cortés in 1520 brought the chocolate and vanilla spices back from the Aztecs to Spain, almost spontaneously the controversy started. Well, not quite. Before discovered by Cortés, Aztecs used coco beans as a form of currency, 100 beans could buy a good sized turkey. The Aztecs even believed that coco beans had divine properties, similar to many women’s feelings about chocolate once a month. When good ‘ol Cortés first tried chocolate he described it as “a bitter drink for pigs”, but after it was mixed with cane sugar it spread like wildfire across Spain. While chocolate blossomed and spread over Spain, vanilla remained centralized in Central America. Why you may ask? Because that was the only place it could be successfully grown. When vanilla grows it produces a flower and only if that flower is pollinated by a certain type of bee will it produce beans. It wasn’t until 1841, when a French slave girl discovered that vanilla could be hand pollinated, therefore produced globally and used in abundance. Today we have vanilla everything: vanilla cupcake, vanilla ice cream, vanilla candles, vanilla body spray, vanilla soaps. In a way, vanilla won. Vanilla has psychological effects that can calm you down and can prevent you from getting over anxious, it is the number one ice cream flavor in the world, and it is my mom’s favorite cupcake flavor. My half-birthday presents! Wisk, Bowl scraper and heat resistant mat. Thanks Mom! Today I decided to test out a few things. My half birthday was April 18, and my mom sent me some cool baking supplies that she found. 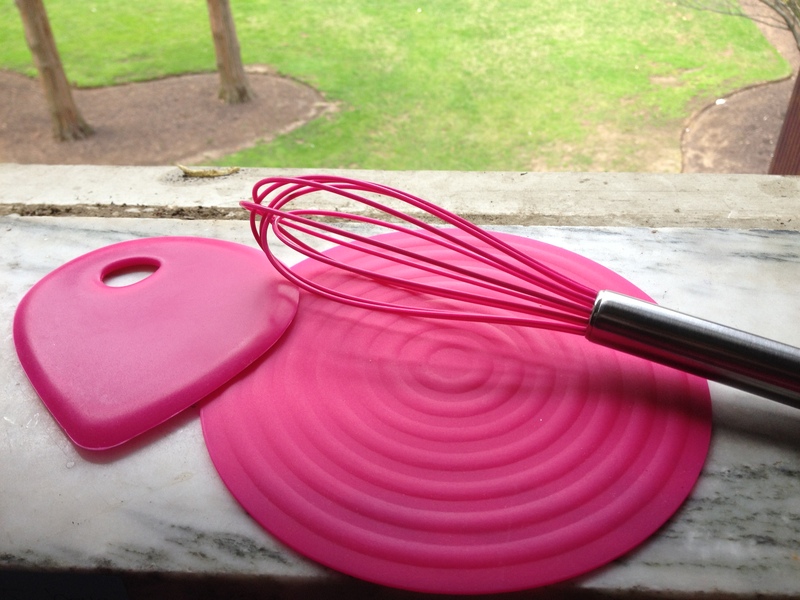 I got a rubber coated whisk, a bowl scraper and a heat resistant mat, all in pink, my favorite color. Also on my half birthday, my homemade vanilla extract was done sitting!!! After two months of waiting what a better way to try out some vanilla cupcakes than use homemade vanilla!!! Making homemade vanilla extract is pretty simple, and can be cost effective. Vanilla extract is two beans per every 4 ounces of vodka, that’s it, nothing fancy just beans and vodka. Vanilla beans in quantities greater than 2 can be found online at Amazon. Twenty-four beans can set you back as little as sixteen dollars, and 4 ounce jars can also be found online for as little as nine dollars for a 12 count. Cheap vodka can be used for this, the cheaper the better! McCormick vanilla extract can cost up to ten dollars for a 3 ounces bottle. When made at home each bottle comes to costing around four dollars per 4 ounce bottle. To make your vanilla extract take two vanilla beans and split them long ways, and then cut them in half. Next submerge the four pieces of vanilla beans into vodka in a four ounce glass container. Place your vodka and bean mixture in a dark cool place for about 2 months. Once a week shake the containers for a few seconds and then put them back. That’s it, in two months you did it! 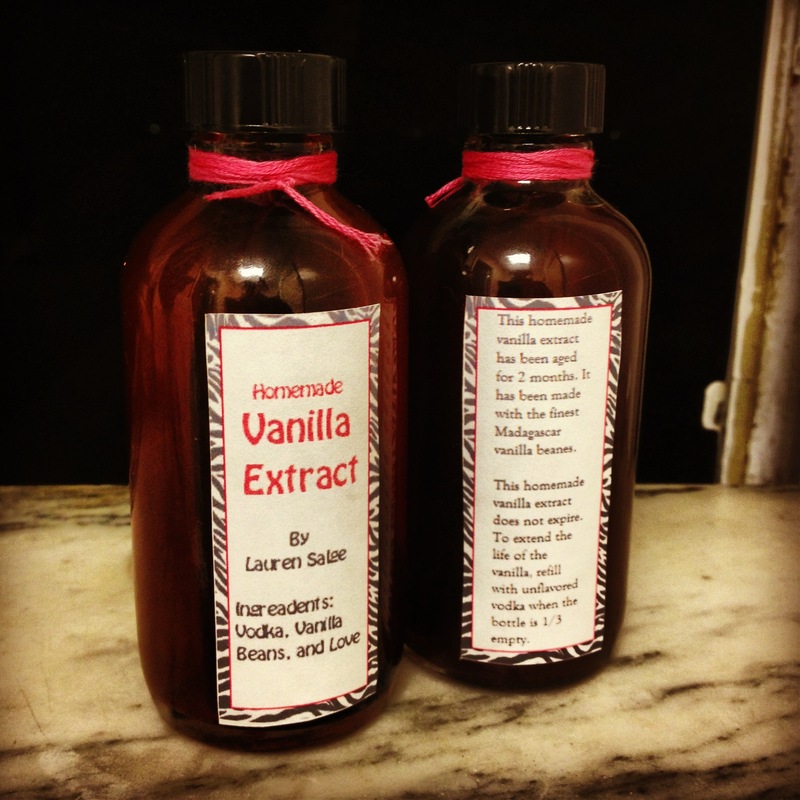 You created your very own homemade vanilla. Anyways back to the cupcakes. 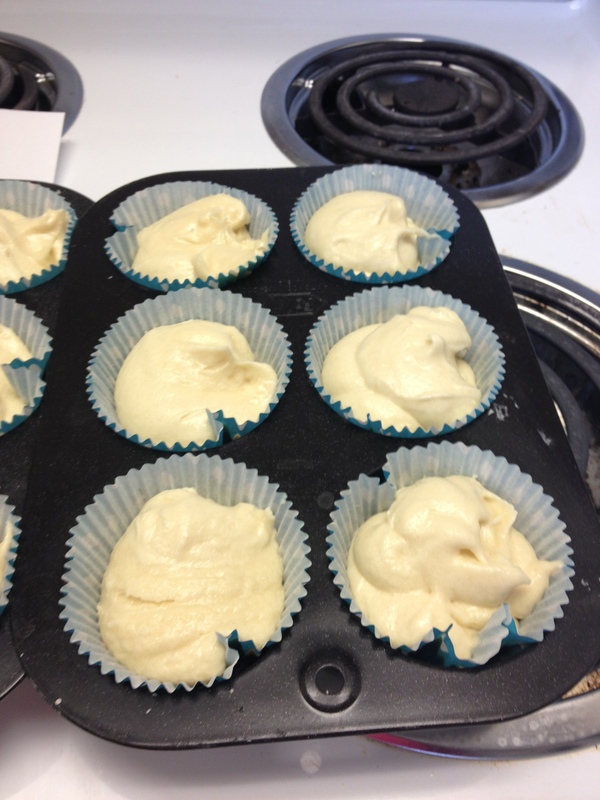 These cupcakes are basic beginner style cupcakes, nothing fancy, anyone can do it. I decided to pair them with a chocolate frosting so the whole chocolate vs. vanilla controversy could come to life in my cupcake. 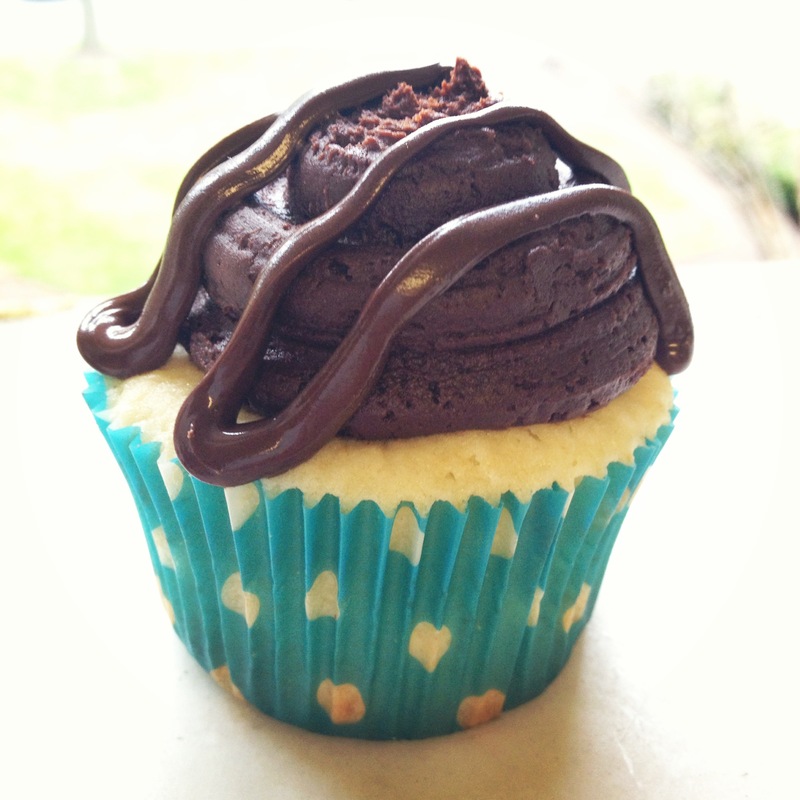 This chocolate frosting was probably the best tasting chocolate frosting ever, but one problem, its heavy. It was extremely hard to pipe this frosting out. I would use this frosting again, but I would use it for a cupcake filling, not a frosting. If anyone has a fabulous light chocolate frosting and they are willing to share, please, I am accepting donations. 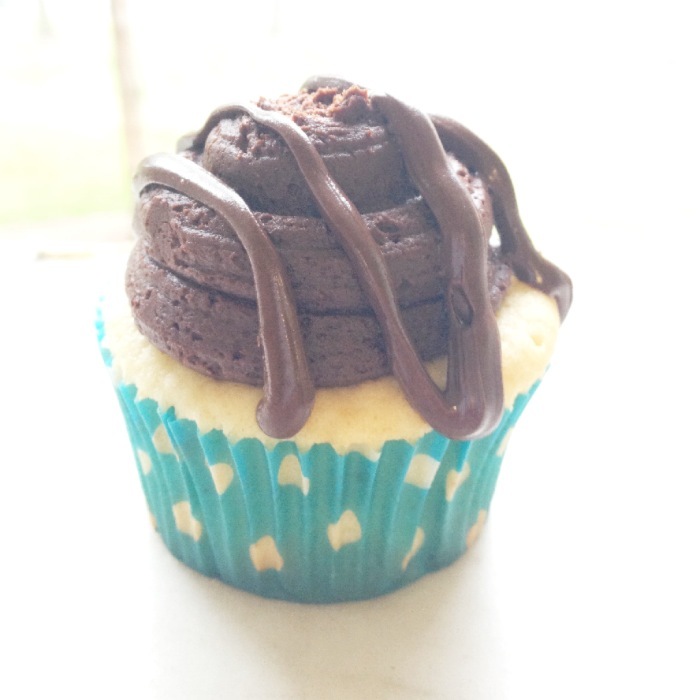 This vanilla cupcake with chocolate frosting is the reason that there is a controversy over which flavor is better. The cupcake itself is air. The vanilla flavoring comes through very well, it is sweet but not candy land gone suicidal sweet, with undertones of the cake my mom made for my eight birthday party. The frosting on the other hand, it might as well be chocolate fudge. This is a chocolate lovers dream! With just cocoa powder, confectioners’ sugar and butter, the chocolate comes to life. It is sweet, rich and smooth. I was going to drizzle the cupcake with white chocolate but an incident with a plastic bag and the microwave said that milk chocolate would have to suffice. 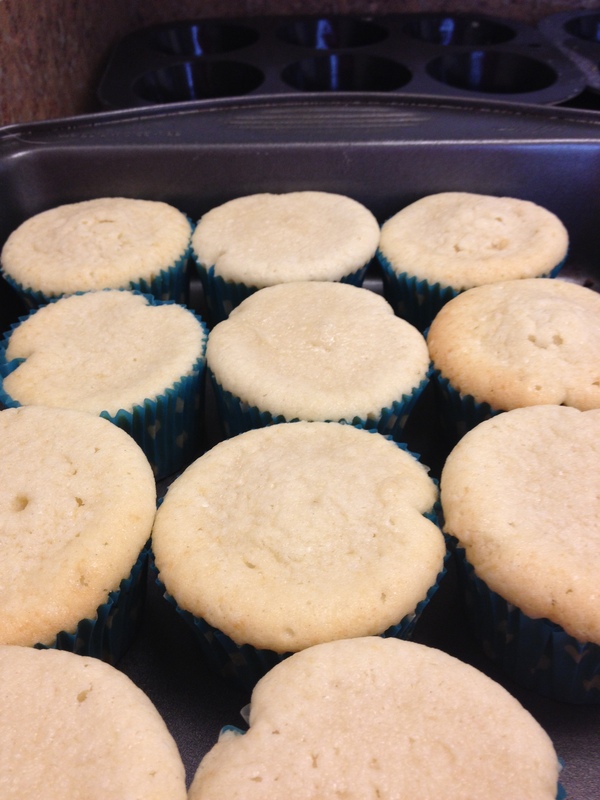 For a beginners vanilla cupcake, or a cupcake to show off your homemade vanilla skills I highly recommend using this fool proof vanilla cupcake recipe. 3. Add in eggs one at a time, mixing after each addition. 5. In a separate bowl, stir together all dry ingredients. 6. Mix wet ingredients to dry. 7. Add butter and milk, Mix until combined. 8. Bake 18-20 minutes or until the tops are slightly golden. 2. In another bowl mix together 4 tablespoons heavy cream, vanilla and butter, beating till smooth. 3. Add sugar and cocoa mixture 1 cup at a time until all combined.